All photos today are of my own house and belongings. Perhaps you might think I have a lot of stuff? But it was much worse before, trust me! 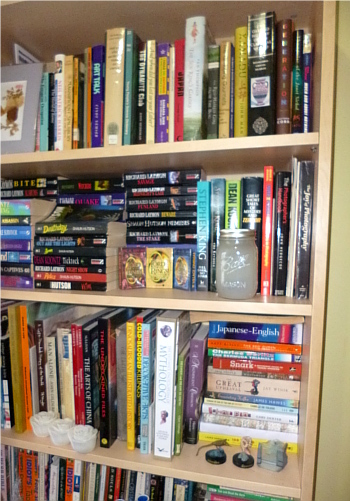 Many de-cluttering books and shows take a 'hard love' stance on the subject. They envision a frenzy of throwing things out, with garbage bags full of unwanted clutter lined up on the footpath. To me, it seems quite cold and heartless. Anyone who has seen TV shows like Hoarders can clearly see what an emotional toll the process has on the homeowner. In these shows, having an emotional reaction is usually depicted as a weakness to be overcome. Even when a psychologist is brought in to help the subject, his or her struggles to deal with the process are swept aside when a group of hard-nosed de-cluttering experts turn up armed with rubber gloves and a huge skip. In contrast, the KonMari method is gentle. Marie Kondo says it's important to acknowledge (she uses the word 'relish') the emotions that come up during tidying; this actually makes the decision easier, not harder. The decision to keep or discard is made by asking yourself whether the item makes you happy. KonMari asks: does holding the item make your heart leap and put a smile on your face? If so, then keep it! every time I open my wardrobe door. Happy. I found it interesting that in the title of her book The Life-Changing Magic of Tidying, Kondo uses the word 'tidying' instead of 'de-cluttering'. This is the case throughout the book as well. Konmari never uses the word 'clutter' or 'rubbish' to refer to possessions, and she is careful to use terms such as 'discard' or 'retire' instead of 'throw away' or 'get rid of'. The book has been translated from Japanese, but I think this careful use of terms is very deliberate. As I learned from the Fluent Self method of self-care, the words we choose are very important. Words like 'de-cluttering' and 'getting rid of' tend to create an automatic resistance in people's minds. Gentler, more respectful and positive words make people more amenable to following the method. Body wash and face mask samples are all grouped together in the bathroom. It seems that many people have misunderstood the KonMari method, thinking it promotes a lifestyle of minimalism. It doesn't. The method merely says to keep all of the items that make you happy. KonMari says not to feel bad if you want to keep something. This means the item sparks joy and you should keep it. Recently on NHK TV there was a special called Tidying in New York with KonMari (I believe it's on YouTube now). KonMari was helping a young woman with her apartment. The girl became visibly upset at the thought of having to throw a box of things away. I think they were drawings that she had created. KonMari then said to her, "but if you don't want to throw them away, you don't have to!" Her face cleared and she beamed. The drawings made her happy, so why get rid of them? The aim is not to have as little as possible, but to live in a space where everything in it makes you happy. All of my books are unpacked now! And Husband's too! Many other decluttering methods focus on numbers: you should have no more than so many of each item. Articles on clothes are particularly big on this -- to build a 'capsule' wardrobe, you should have 2 shirts, 2 pants, 2 skirts, etc. The KonMari method doesn't put any limits or absolutes on anything. If you had 43 handbags and 38 of them spark joy, keep those 38. (Not that that's a specific example from my own life or anything, ahem.) If, for example, you don't keep any skirts at all because you don't like wearing skirts anymore, that's fine, too. 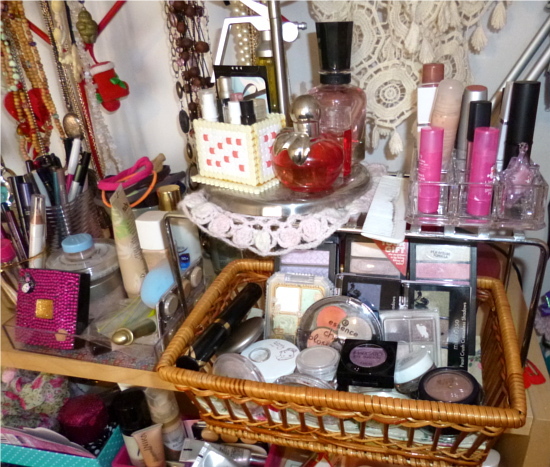 and arranged in trays and a basket from Daiso. The 'does it spark joy?' method of deciding what to keep acknowledges that everyone is an individual. As Marie Kondo says, everyone has a different understanding on what the appropriate amount to keep is, so there's no point in specifying numbers. The important factor is whether or not you feel comfortable being in that room. Some people prefer a minimalist room, others love being surrounded by their treasured items. The KonMari method allows people to express their personality. If you have 50 kitten figurines and 48 of them spark joy, then it's perfectly fine to keep all 48. Keeping 48 kitten figurines might seem completely bonkers-crazy to one person, but totally normal to another. It's up to you to decide what's right for you. Many people who collect things for a hobby can't put their finger exactly on why they do it. There's no rhyme or reason behind it, only emotion. Other methods of decluttering often don't acknowledge this urge. Nobody needs 20 teapots, or 3,500 troll dolls. Sources that tell you to discard excess items or throw away things you haven't used in a year aren't helpful for someone who has a valuable and treasured collection of original boxed Star Wars figures. Asking yourself if this item really makes you happy is a much more appropriate way of going about discarding when it comes to collections. ugly fishing tackle box I packed them in to move house. For those who lean towards an animist view on life, the respect with which Marie Kondo treats her possessions will be familiar. Before she begins tidying a client's house, she greets the house and asks it to show her where it would like everything stored. She advises that when discarding an item, to thank it for its service. This allows you to discard it with a clear conscience instead of guilt. Finding a permanent spot in the house for the remaining items is also very important. She says: when an item has its own place, it's happier, and this vibe spreads to the whole room and its occupants. 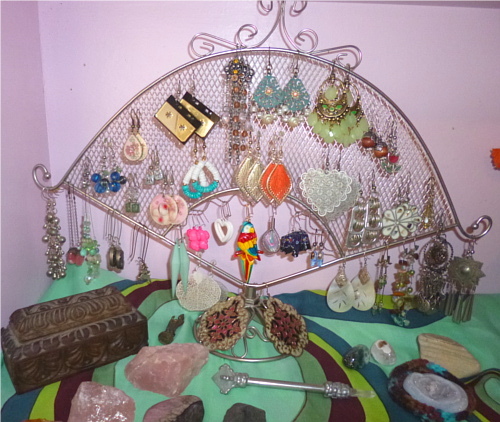 I finally found all of my dangly earrings and the stand to display them on! So happy! The stand is on an open bookshelf opposite my bed so I can see it all the time. Marie Kondo doesn't give advice regarding particular types of storage systems. In fact, she advises against purchasing elaborate storage 'solutions' for the home. 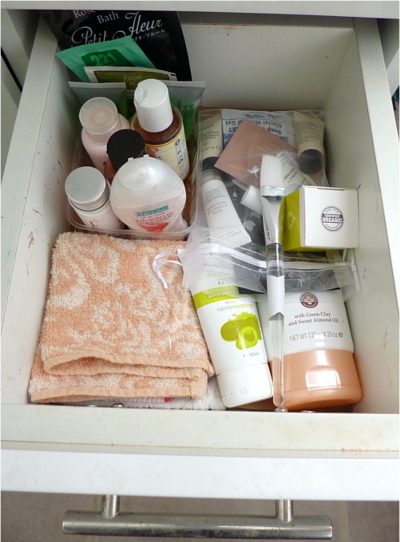 This, she says, only leads to acquiring more because excess items are out of sight and you may forget you have them. 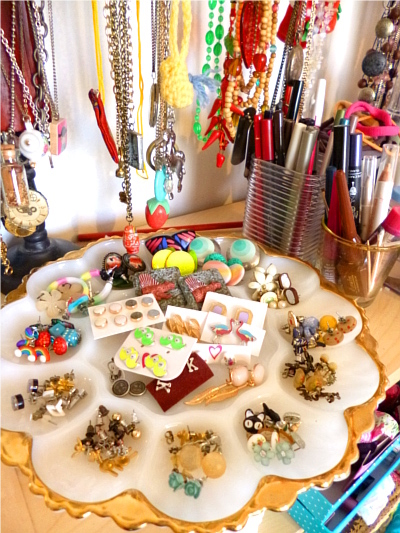 She herself uses old shoeboxes and other re-purposed things to store many of her belongings. What's important is that when you open a cupboard door, you can see everything you own, and it makes you happy. Your storage can be as elaborate or simple, expensive or cheap as you want it to be. 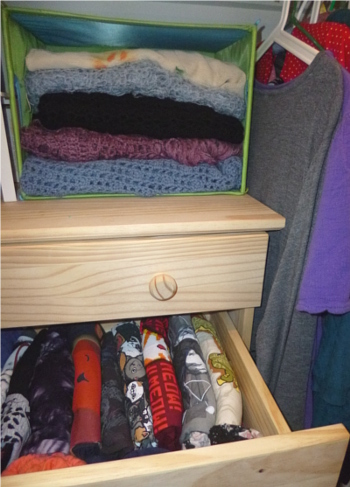 I have some more posts in the pipeline on the KonMari method, such as tips, how I deviated from the method (gasp!! ), and how it has changed my life. Has it? I'm not sure yet. Stay tuned to find out!